India’s construction sector is experiencing unprecedented growth due to both a rising economy and population. Over the next decade, it is expected to grow at seven to eight percent annually. In fact, the total building floor area is expected to increase by four to five times between 2012 and 2047. From 2012 until 2047, the residential building area is expected to increase by four times, the commercial sector area by 13 times. While growth is a positive indicator of India’s development, it also poses considerable challenges in terms of energy demand and supply, as well as carbon dioxide emissions. At present, India’s buildings account for 33 percent of the country’s total electricity consumption. With the increasing building stock as well as the intensity of electricity consumption in urban buildings, mainly due to rapid growth of air conditioning, buildings will soon become the largest consumer of electricity in India. The Building Energy Efficiency Project (BEEP) is a bilateral cooperation project between the Ministry of Power, Government of India, and the Federal Department of Foreign Affairs (FDFA) of the Swiss Confederation. Started in 2011, and with the current phase running 2017 – 2021, the project’s central focus is to help India mainstream energy-efficient and thermally comfortable (EETC) building design for both commercial and residential buildings. BEEP works with building industry, policy makers, and building owners to catalyze adoption of EETC building design and technologies. The Bureau of Energy Efficiency (BEE) is the implementing agency on behalf of the Ministry of Power while the Swiss Agency for Development and Cooperation (SDC) coordinates the project on behalf of FDFA. Read more about trends in the building sector in India and SDC's role in The SDC Global Brief: Better buildings equal less pollution: The SDC supports India in its efforts to combat climate change (2018). The BEEP team works directly with various stakeholders of the building sector such as policy makers, builders, developers, architects, engineers and academic institutes. They also work along side national and international organizations and initiatives to localize global trends and innovations in the field of EETC buildings. BUILDING DESIGN: BEEP promotes the Integrated Design Process (IDP) for designing EETC buildings. BEEP’s approach primarily focuses on reducing heat gains from the building envelope, improving natural ventilation, use of energy efficient space cooling and application of renewable energy. POLICY: BEEP promotes the integration of measures for energy-efficient and thermally comfortable buildings into national, state and city-level policy. 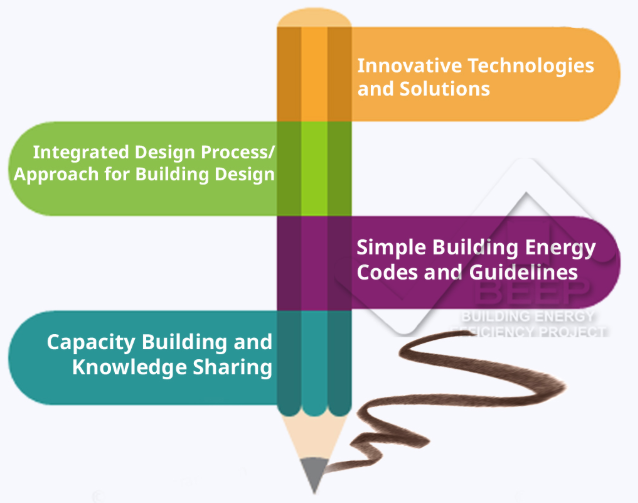 BEEP has assisted the Bureau of Energy Efficiency (BEE) in developing building codes and guidelines (see below). OUTREACH: Knowledge on energy-efficient and thermally comfortable buildings widely communicated. BEEP focuses its outreach on Events (including seminars and trainings), Networks for the building industry and for students and educators (including an annual camp), and Awards. Energy conservation building code for the residential buildings submitted to the Government of India and circulated for public review. BEEP has assisted the Bureau of Energy Efficiency (BEE) in developing the Eco Niwas Samhita 2018 or 'The Energy Conservation Building Code for Residential Buildings' (ECBC-R Part I: Building Envelope)(see film above). The Eco Niwas Samhita 2018 is the first Energy conservation code for residential buildings in India. The building code is a landmark policy with the potential of reducing millions of tons of CO2 emissions in India. The Ministry of Housing and Urban Affairs of the Indian Government has confirmed, that the building code will also apply to the 12 million affordable homes the Government of India plans to build by 2022. In addition the the Building Code, BEEP has developed a complicance check tool to support the implementation of the building code. Guidelines for the design of energy-efficient multi-storey residential buildings for three climate zones in India released (composite, hot-dry and warm-humid climates). The Design Guidelines for Energy Efficient Multi-Storey Residential Buildings provide recommendations on energy-efficiency features and are helpful for builders, developers, architects, and other building-sector professionals involved in the design and construction of multi-storey residential buildings. The design guideline document was highlighted in the Intended Nationally Determined Contributions (INDCs) submitted by the Government of India in the run-up to the Paris Climate Change Conference in 2015. Technical advice to 22 building projects showed 25-40 percent energy reduction potential through better building design with minimal cost additions. BEEP regularly conducts Integrated Design Charrettes for selected building projects in their early design stage. These charrettes are led by a team of senior Swiss and Indian architects and engineers and aim to develop a viable energy concept for the building project. Several related case studies have been undertaken, including one aimed at achieving high energy performance in an office building in Rajasthan: The Aranya Bhavan Project, and on developing thermally comfortable and climate-friendly affordable housing in India: The Smart GHAR III Project. Support for the design of energy-efficient public buildings. BEEP has assisted a few states in developing Design Guidelines for Energy Efficient and Thermally Comfortable Public Buildings and has produced a paper on Mainstreaming Energy Efficient Building Design Practices in State Public Works Departments. Templates have been developed for the design of energy-efficient public buildings for the states of Karnataka and Rajasthan. Technical advice has also been provided to Andhra Pradesh for the energy-efficient design of its new capital. Between 2018-2021, BEEP will further assist the states of Rajasthan, Gujarat and Andhra Pradesh. Five Indian labs trained in testing building insulation material by Swiss experts and 1,500 building professionals introduced to energy-efficient building design processes and specific strategies for energy efficiency in buildings through seminars and trainings. Five new designs of external movable shading systems (EMSYS) facilitated and tested. In 2015, BEEP undertook a unique design competition to unearth creative innovations towards India-specific EMSYS designs and solutions. The top five designs for the residential and commercial categories were given financial reward to develop prototypes, which were then tested for their effectiveness in blocking the sun. With good incubation support, the winning designs can be developed into viable products for thermal comfort in Indian buildings. Between 2018 and 2021, BEEP will extend support to manufacturers and others working in this area to develop and test EMSYS products and in developing the market for these products.